After three anthology inclusions she could no longer participate because she was then considered a “professional.” Pat still gets a five-pound packet of royalty statements from Simon & Schuster a couple times a year. All of the numbers, however, are still parenthetical. 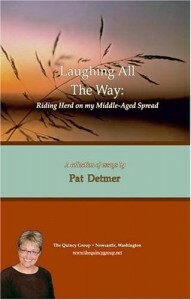 "Laughing All The Way - Riding Herd on My Middle Age Spread"
A collection of humorous personal essays.